Wouldn’t it be so fab if pasta was good for you? One can wish, right? Since I started making healthier changes and coming to realization that I have a gluten intolerance, I have been on a mission to find as many healthy versions of Italian inspired recipes that I possibly can. There’s one that has been on my radar for awhile, and I FINALLY made it last night: Zucchini Ravioli! You guys…..these were so delicious! Here’s the recipe! -Preheat oven to 375, greasing 9×13 baking dish. Spread some marinara on the bottom of the dish. -To make the “pasta”, cut zucchini in half (lengthwise), then use a vegetable peeler to slice zucchini into thin “noodles”, peeling until you reach the center. It’s okay if they are thin or uneven. -For the filling, mix the ricotta, egg, oregano, and parmesan in a bowl. You can use other spices if you prefer (many recipes call for basil in place of the oregano). -To assemble the ravioli: layer two pieces of zucchini with another two, placed perpendicular. Your zucchini noodles should look like a plus sign. Spoon about a tablespoon of the ricotta mixture into center of zucchini, then fold toward the center, starting with the the vertical pieces, then the horizontal. Once folded, place the ravioli seam side down in the baking dish. Once ravioli have been placed in dish, top with marinara and shredded mozzarella cheese. Bake for about 30 minutes or until the cheese is melted and starting to brown. Top with parmesan if you like and serve! -Don’t go for large zucchini. I made the mistake of trying to use a homegrown one that was ginormous, and because of the size, it was harder to make the noodles. Medium sized work best. Size does matter! -You can use a mandolin over a vegetable peeler if you want. I personally found the peeler much easier. -You can change up the filling. Next time I think I will mix in some Italian sausage because I typically do a meat/cheese option in my ravioli. You could also use spinach or veggies. This was a fabulous swap, and I highly recommend it. You’ll be seeing this on my meal plan many many times! Squash the stereotype….Italians can survive without pasta! Little Pop Quiz for Ya…. Q: What is the one food item that is the most difficult to give up when you are trying to eat healthy AND have Italian in your blood? 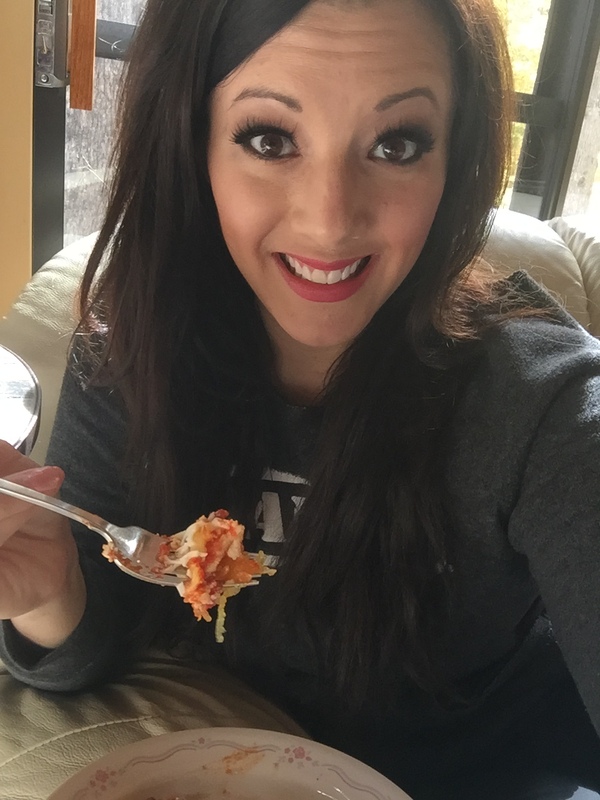 Don’t get me wrong….pasta isn’t entirely bad……especially when you eat the proper portions. However, what Italian do you know that actually eats the proper portion of lasagna, spaghetti, etc? I know I struggle with it. 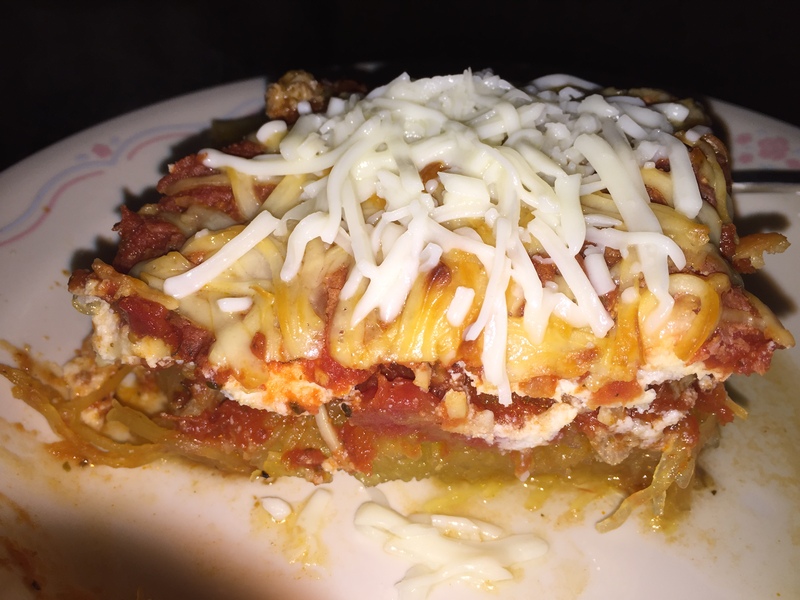 I found a way to disguise vegetables as lasagna! 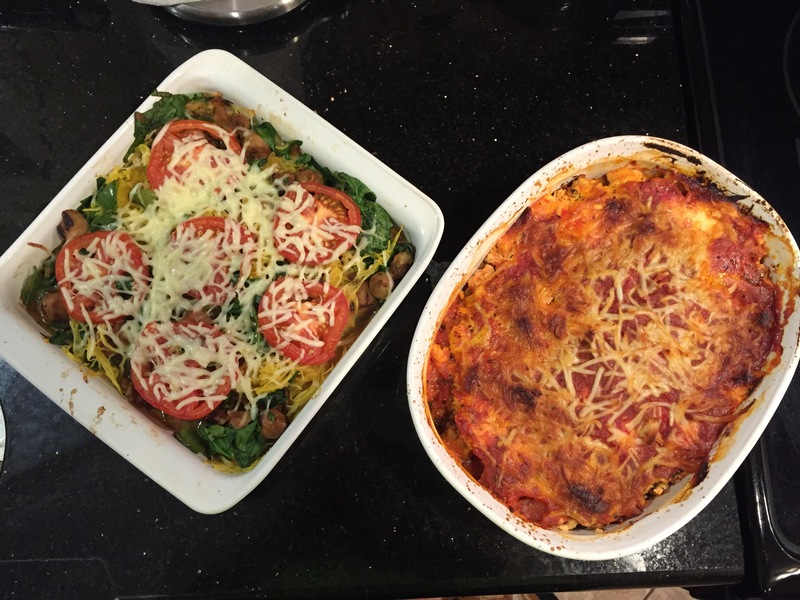 This week I made the most amazing lasagna that allowed me to have a pretty substantial portion. Since I am now obsessed with this recipe (I think I will be making it weekly), I had to share. -I place mine on a cookie sheet and bake for about 55 minutes at 400 degrees. I literally do nothing to the squash other than plop it on the cookie sheet. ***Sidenote….Aldi’s presently has squash on sale for about $1.29 each! Stock up! -Brown the sausage (make sure to remove the casing….what a fun, slimy, gross job) and spray a casserole dish. Once you remove the squash from the oven, set it to 375 (the temp for baking the lasagna). Cut the squash in half, remove those blasted seeds, and use a fork to remove the “spaghetti”. Bake for about 15 minutes at 375. That’s it! Super easy, and it is absolutely delicious! You can change this up if you want…maybe you don’t want the meat; you can go without. Pair it with a nice salad, and your Italian heart can be happy. 21 Day Fixers, one portion of this is equivalent to ONE GREEN, ONE AND A HALF RED, HALF A BLUE, and ONE THIRD OF A PURPLE. Don’t be a squash snob…..spaghetti squash is so versatile. And with this recipe the Italian in you doesn’t have to feel guilty about lasagna! Enjoy, my fellow health conscientious Italians!